- We clarify on the mysterious disappearing play and download counts! - Do Podcasters Really Need a Website? Our Tip of the ... See More Week is back: Do You Really need a Website for your Podcast? We will discuss that later in the episode, but let’s get to the “MAIN EVENT”! - This change has drawn concerns from many, this change was recommended by me to the Spreaker team a year ago. - I believe and my experience is that most show creators don’t really want everyone to know these numbers. Most very professional pro podcaster only share numbers with advertisers. - Listeners seeing these numbers can lead people to only listen to your most popular episodes, the sheep syndrome. - This is because before we aggregated plays + downloads in the same `Plays` and now we separate them, so the sum of `Total All time plays` and `Total Downloads` in the CMS should be the number they had before. This show can be heard in: SLS show Apps on iOS and Android, Spreaker Podcast Radio apps for Android and iOS, iTunes, iHeartRadio, Stitcher, Google Play Music, Radioline.com! Please leave a review. 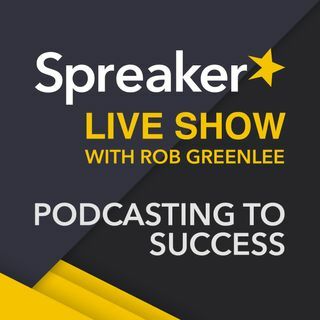 Reach me at rob@spreaker.com and @robgreenlee, Alex how can listeners reach you? Podcasting Tip of the Week is back: Do You Really need a Website for your Podcast? -Truth is that your website will not be the primary place people use to listen to your show, but is a marketing tool to help with listener recruitment, loyalty building and sampling. -Spreaker has a WordPress plugin for posting episode to your blog. -Search discovery and an easy way to drive listeners to learn more about your show. Are there any plans to add video to the desktop app?